Rahul Gandhi does ‘Mann ki Baat’ at LSE. But can he really lead India? Rahul Gandhi was philosophical and theoretical on many questions even though it was clear this visit is a pre-2019 election tour. 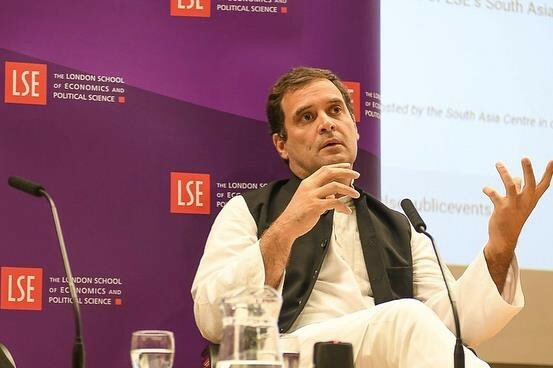 London: “Thanks for your unscripted Mann ki Baat”, screamed a voice from a 600-capacity audience at the London School of Economics where Congress President Rahul Gandhi was speaking, in his first series of public discourse ever, during his London visit Friday. His speeches in Germany, and earlier in the day at the International Institute of Strategic Studies in London on the psychology of ISIS, comparing RSS with Muslim Brotherhood or the Doklam issue with China may have evoked the wrath of the BJP in India. And it can be argued why leaders from India, of all hues and parties, tend to address the Indian electorate on foreign soil. But Rahul Gandhi’s LSE interaction did indeed expunge a sense of self introspection. Also read: How many light bulbs does it take to change Rahul Gandhi? Students from several prestigious universities across Britain had travelled to attend the interaction compered by LSE’s Assistant Professor Dr Mukulika Banerjee. Rahul Gandhi said Congress has learnt a lesson from the debacle in the 2014 general elections, adding that “a certain degree of arrogance” had crept into the party after 10 years in power. “That’s what went wrong”, he said, and noted that there has to be “a merger between the past and the future”, which did not happen in 2014 but is now being rectified. When asked by a member of the audience about the 1984 riots and killing of Sikhs in India, given the recent growing pro-Khalistan voices in Britain by certain groups urging a 2020 referendum, Rahul Gandhi said, “I condemn that a 100 percent”, and advocated the strictest punishment for those involved in it. While he is on a whirlwind tour in this part of the world, the British parliament is in recess, and as a result he met a handful of Labour MPs of Indian origin. There has been no confirmation on who he is meeting from the government. Wrong choice of time, Mr Gandhi? While being philosophical and theoretical on many questions, Gandhi made sure he pushed in part of his electoral plan, while mentioning the “job crisis” in India and the Rafale deal. He noted that India can punch above its weight only by creating jobs, but India has a “job crisis”. He said that while China produces 50,000 jobs every 24 hours, India produces 450 jobs during the same period. “How can India punch above its weight when you ignore fundamentals? You do not support your agriculture sector,” he said. But the question remains unanswered, can Rahul Gandhi run a country as complex, varied and large as India? After his first five-odd minutes of awkwardness at the start of the session, he came into his own, but is that enough to lead a nation? The author is a London-based freelance journalist. Rahul is the best man to lead the country ,India. Modi don’t have the capacity to lead modern india.he split the country in religious lines,which is very danger to the world.he dont have any idea to develope economy and employment.the worst ever P.M we have in the democratic world. Most people already know if he is good enough to lead India – they dont need answers. He has no administrative experience to show and he is aspiring to lead one of the most complex societies in the world. To be able to sound convincing you should have some track record of excellence (like Manmohan Singh) or you should be a good orator (like Vajpayee/Modi) or you should have some credibility based on experience (like Modi). Just glib talk with no substance will get his speeches a few more likes from his fan club but nothing more. The trend of senior functionaries speaking critically of their opponents on foreign soil is recent. It would be good if it can be reversed. 2. In India, most people get the top job after long years in public life. They either shape up or get shipped out. Shri Rahul Gandhi’s great grandfather had no administrative experience in 1947 but he was at the forefront of the long freedom struggle, went on to become India’s greatest prime minister. So did his daughter, although her record is decidedly more mixed. Father did not live up to expectations. Mother ran the country by proxy for a decade, proved she was no “ mere housewife “. If gentleman becomes PM by a combination of being born great and having it thrust upon him, would do well to surround himself by first rate people and give them considerable latitude to perform in their areas and to also provide good advice. “ 2. “ A certain arrogance “ has never been far from the Congress, even today in adversity, power is a different scene. Since it will be back to an extended coalition era, the sense of entitlement should be kept in check. And the question also remains if he replied to Doklam question during his interaction or he just skipped it by saying that he doesn’t have enough information on the issue. Yet he’s all mouthfull speaking on the topic in the assembly. He surely deserves to be the PM… But of Pakistan. In than way he’ll be doing justice to all.